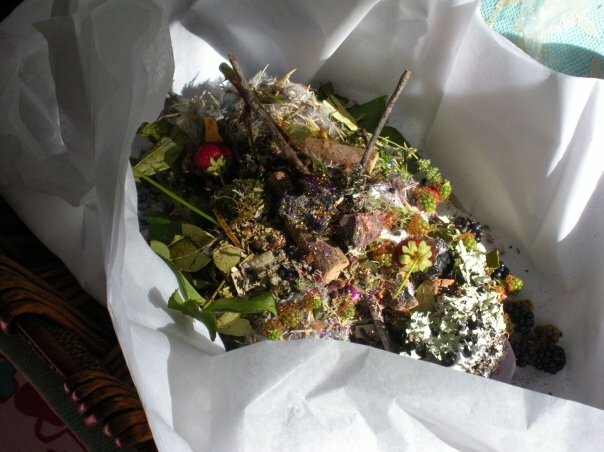 The Pachamama, Mother Earth, offering is a collection of natural substances representing that which we want to purify and manifest in our lives. Pachamama loves everything from herbs and flowers, to crystals, coins, and shells. As long as it can be burned without harming the environment it is considered an acceptable offering. We do the Pachamama, Mother Earth, ritual every year as way to bestow our gratitude, love and respect for the earth and all its creatures, as well as those from other realms like the faeries, our spirit guides, and ascended masters. We give our thanks for the blessings we have received and lessons we have learned. Through this ritual we show Pachamama our devotion to serving and protecting the earth. As a thank you for our dedication in service to her she grants us our manifestations [if she so chooses]. 1. Sage yourself with some of the ritual sage provided. It’s a good idea to kneel before the altar. Ground yourself – feel yourself rooted to the earth. 3. Tell Pachamama how grateful you are for her and feel it in your heart. Say: Dear Pachamama, Mother Earth, I am so grateful for the blessings you have bestowed upon me. Thank you for your natural beauty. I have so much love and respect for the earth and all its creatures. 4. Select an offering from one of the selections and hold it in your hand. 5. Next – Ask Pachamama to purify that which no longer serves you. Perhaps it is something that distracts you from fulfilling something that is your true heart’s desire. [By purifying and transmuting that which no longer serves you, you clear the way for your manifestation]. Say: Dear Pachamama, Mother Earth, it is my will to purify and transmute (state your intention). Please accept this offering. It is filled with my heart-felt thanks and gratitude. 6. Place your offering in the pile. Remember to breathe! 7. Select another offering and hold it in your hand close to your heart. It could be one or a mixture. Pick ones that best symbolize your manifestation. 8. 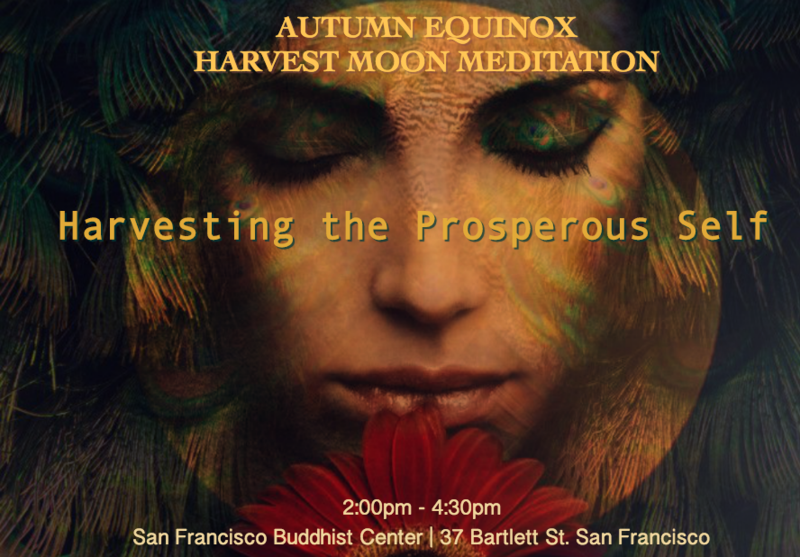 Next – Ask Pachamama to manifest something in your life. It’s always best to request your true heart’s desire. Be sure to choose only ONE thing, and be as detailed and specific as you can be. See yourself experiencing your manifestation like a movie, and feel the joy, love, & excitement around that. Be sure to fill your heart with love as you visualize your manifestation. Say: Dear Pachamama, Mother Earth, it is my will to (state your manifestation). Please accept this offering. It is filled with my true heart’s desire and deepest gratitude. 9. Place your offering in the pile. Remember to breathe! 10. Take a deep breath and when you are ready you can get up and join the ritual circle. If it is early on in the day, before the ritual takes place, be sure to sage yourself before leaving. Summer Solstice is a magical time and one of my favorite times of the year. For one it’s my birthday and it’s also a faerie day, where the veil between our world and the land a faerie is thin. For these reasons I have a very personal connection to this season. Even before I started on my spiritual path I would celebrate my birthday outside in nature, and often dancing under the stars. It was when I met my faerie partner in magic Melanie Dawn that Solstice started to have an even deeper meaning for me. It was the first of the Sabbats that I began to honor and celebrate. It marked my initiation into the “Old Ways” which has lead to fully embracing my inner faerie and spiritual self. Summer Solstice occurs sometime between June 20th – 21st in the northern hemisphere. Solstice means sun stands still and this is because as the sun reaches its highest point in the sky for the few days on and around Solstice the sun appears to stand still in the heavens. It is the longest day of the year, where the night is short and the light reigns. Just imagine how magical this must have been to ancient peoples who worshiped the sun as their God. The Sun represents the divine masculine and is the giver of life. Ancient peoples depended on the sun for sustenance and food for the coming winter months ahead. Cultures all around the world for eons have held celebrations, festivals, gatherings and rituals to mark this special time of year. Fire ceremonies are traditional for Solstice to pay homage and honor to the sun. Another name for the Summer Solstice is The Cusp of Magic because all the land is bathed in warmth and light and the earth is lush and full of worldly delights. Everyone loves the summertime. It’s a time to play and enjoy the warm season. We also get to enjoy seasonal fruits such as berries, stone fruits and other delicious treats from the earth. All these things are possible because of the sun and the other elements that generously give to us year after year. It is also the time you are most likely to see or encounter a faerie or faeries. Faeries love this magical time and celebrate by dancing, singing, playing, making mischief and partaking in the drink and fruits of the season! For the past 15 years we have been involved in or have thrown a party in honor of Summer Solstice. The first big outdoor party we went to was for my 21st birthday up in the Sierra Mountains where the altitude connects you to the heavens in a truly magical way. A synchronistic day indeed, my golden birthday 21 on the 21st! At this event we made many long lasting friendships which have been a true blessing and changed our lives and many wondrous and lovely ways. Over the years we have held our celebration all over California, but since 2003 we have been lucky to have the use of our good friends Dane and Derek’s property on the Carmel River. This land is very magical and having the river, trees, animals and elements makes this a very special place. Friends and family gather for the weekend to enjoy the land, listen to music, eat well and celebrate under the sun, moon and stars. The thing I look forward to most about Solstice is our traditional ritual and the creative inspiration that comes with the planning and preparation. 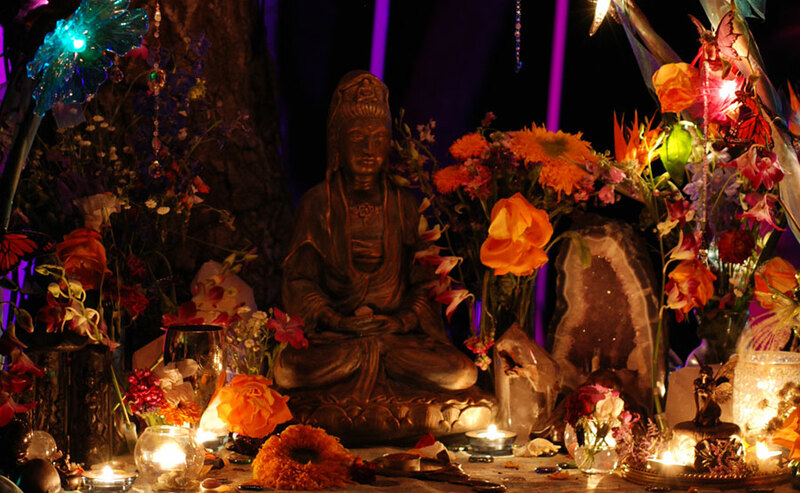 All year we work hard coming up with ideas for the altars, the ceremony and attending to the little details that make each year special and meaningful. Each year we do a gratitude ritual to give thanks for all the good things in our lives. We also use this opportunity to release anything that is not serving us and begin the process of manifesting our dreams into reality. Attendees dress in white, and we each add magical herbs and other offerings to a collective offering to honor and thank Mother Earth, Father Sky, Grandmother Moon and Grandfather Sun. The idea of the ritual is based on the Goddess Pachamama, she is a Mother Goddess who’s name means Mother World or Good Mother. She is native to indigenous peoples of the Andes. We of course add our own individuality and creativity to this ceremony based on our intuition and feelings, thus making it our own. We prepare a sacred ritual fire, and allow it to burn down. We then add our offering to the embers and wait and see if Mother Earth will accept our offering. We know its accepted if bursts into flames and burns. Every year we lose our breath a little while we wait to see if our offering is accepted. A truly magical and blessed moment! It is truly amazing to witness how our celebration can touch and inspire the people who attend. Many moons ago Melanie Dawn made a wish for me. Her wish was that I would grow and embrace my true spiritual nature. Guess what? That wish came true! All because she lighted the way for me and opened the door. For this I am eternally grateful and honored. This is our heartfelt wish for everyone who is lucky enough to experience our Solstice celebration and ritual. We want to light the path that opens the way to embracing all your spiritual gifts and raise the collective consciousness of all who are open to recognizing that there are many blessings in life to celebrate. The power of belief is real and by expressing your heartfelt gratitude and focusing your intent you can make all your dreams come true! May your Summer Solstice be filled with magic, and faerie dust! Blessings to the Faeries and Ascended Masters who guide us! There have been many times we have been asked what it means to be faerie or even just how to be a faerie, so we thought it was time to share what we know and do with you. Being faerie is honestly the most fulfilling, magical and beautiful way we have chosen to live our lives. Overtime, we found the more we embraced this part of ourselves and allowed it to express itself in whichever way it pleased, the more we became it with every essence, every molecule, ever particle of our being. Hence the term “being faerie”. Now, we’re not going to try and pull the wool over your eyes and say we never encountered any resistance. There has been plenty of that. Sometimes from the outside world, sometimes it was our own egos. However, the more we tuned into this inner part yearning to express itself the more gratitude and fulfillment we were shown for honoring it. Any time we were bound and determined to keep it more hidden or contained, seemed to be the times when the universe just made sure to give us the right nudge to let it out where it could shine. There will always be some out there that think living your life as a faerie is silly or childish, but silliness and childlike behavior is all part of being faerie anyhow, so don’t worry about the naysayers. Let them brew about, while you choose to arrive at a place where imagination is limitless. The truth be told, there is much grace, dignity, and elegance that goes with being faerie. Choosing to live this life means being true to you, against all odds. It means embracing that which cannot be seen by those with an untrained mind and projecting it in a way that they can. It means dreaming, it means believing, it means tapping into a feeling of pure joy and devotion, and expressing it without limitation. It means spreading your wings and flying. Sounds wonderful, doesn’t it? It is. Whether you’re already living a full-fledged faerie life, reading this to discover your inner faerie, or you are simply just curious about how real faeries live, be sure to check back often for more. We’ll be blogging about all the different things that guide us. It’s sure to take you on a magical fun filled journey of discovery. And if you are just plain old skeptic, we are already giggling at the thought that you might even come away with an inkling of belief. Now that’s faerie magic!